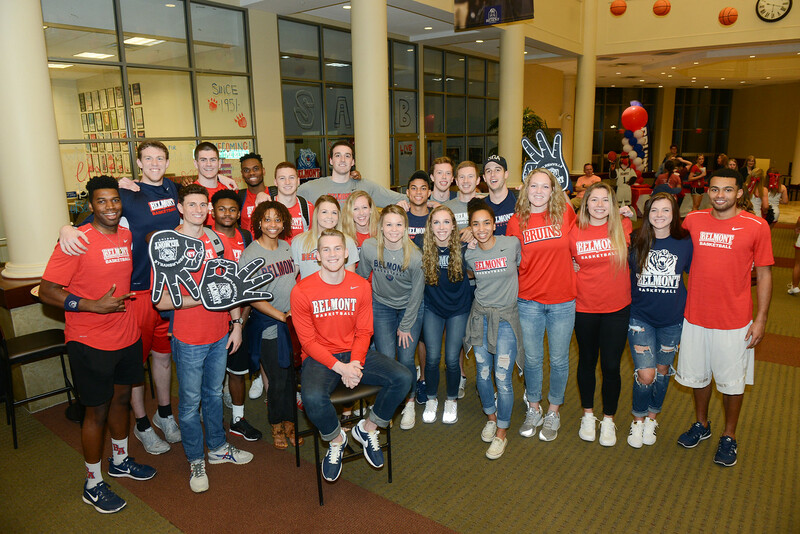 Belmont welcomed the largest group of people in the institution’s history at last week’s homecoming festivities. Following individual class reunions, a huge tailgate at the tower–complete with BBQ and all the fixings, student organization meet-ups and more, both the men’s and women’s basketball teams took on Tennessee State University and came out on top with scores of 87-71 and 68-63, respectively. The women’s game brought the largest crowd in the history of women’s basketball on Belmont’s campus. Leading up to Saturday’s happenings, homecoming celebrations were held all week long across campus. On Mission Monday, Aaron Bryant from Avenue South spoke on missions and service and a concert by the Faculty Brass Quintet was held. T-Shirt Tuesday offered students the opportunity to ‘give a shirt, get a shirt’ as they donated gently used t-shirts in exchange for this year’s homecoming shirt. WOW Wednesday, a newly created day of surprises, included pop-up events across campus all day as senior leaders served popcorn in the Beaman Student Life Center, the University Staff Advisory Council handed out doughnuts in Massey Business Center and staff member and Belmont legend Antonio performed a concert in Harrington Place Dining, among other things. Thank You Thursday gave a nod to Bruin4Bruins, a fundraising initiative launched on Saturday that seeks to raise $150,000 for the student experience. Faculty, staff and students signed a banner to thank donors, in advance, for their kindness. For galleries of images from each event, click here.